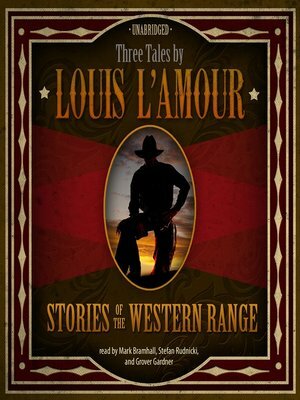 No one tells tales of the frontier better than Louis L'Amour, who portrays the human side of westward expansion—the good and the bad—before the days of law and order. With their texts restored to the state of their initial publication in magazines, here are three stories penned by America's favorite Western author: "Man Riding West," "The Black Rock Coffin Makers," and "Showdown on the Hogback." In "Man Riding West," Jim Gary comes upon the trail camp of a trio pushing a herd of cattle. One of the men has a shotgun, something usually not carried by men on a trail drive, but Jim asks for coffee anyway. Red Slagle, the ramrod of the outfit, is friendly enough—he even offers Jim a job riding herd. Jim can use the money, and the herd is moving the same direction as Jim, who is on his way to work for Mart Ray, an old saddle mate now foreman for the Double A brand. It's the same brand as that on this herd. In fact, the men even claim they are supposed to meet up with Mart Ray at the end of the drive. It's lucky for Jim that he happened along; or is it? Jim has his doubts and suspects the herd is stolen. In "The Black Rock Coffin Makers," two men in the isolated town of Tucker want the XY Ranch, Jim Walker and the ruthless Wing Cary—and one of them wants it badly enough to kill for it. This is a tale of suspense and danger with chases, posses, shootouts, and double-crosses—all for possession of the XY. In "Showdown on the Hogback," Tom Kedrick is hired by a financial syndicate to run a gang of vagrants and outlaws off a certain strip of land. The syndicate has filed for ownership of this land, claiming it is unusable swamp. Kedrick sets out to serve justice, but to his dismay, the so-called vagrants and outlaws turn out to be hardworking ranchers and farmers who also claim the land. These are workers who have improved the land, and they are determined to resist any effort to disenfranchise them.